Azimuthal sides of the canopy affected neither needle morphology nor vascular anatomy. However, a significance was found to be associated with canopy height. The needle morphological and anatomical parameters of vascular tissues were scaled up to the forest stand level. In conifers the needle is the key organ for photosynthesis and transpiration, and these two processes are influenced by the morphological and anatomical structure of the needle. Although many factors are involved in needle development, long-term irradiance gradients through the canopy as well as across the forest are among the main drivers. The present study had two principal objectives: (1) to obtain a better knowledge of the morphological and anatomical parameters of sun, transient and shade needles taken from different azimuthal orientations of a sparse Scots pine (Pinus sylvestris L.) stand; and (2) to scale up these needle data to the forest stand level. One-year-old needles were collected from mature Scots pine trees from branches on the south- and the north-facing azimuthal sides of the canopy at three different canopy heights. Needle structural parameters were measured on cross sections at the needle base. Azimuthal sides of the canopy had no effect on the needle morphology and anatomy since the irradiation was similar on both canopy sides due to the low leaf area index (1.31) of the sparse Scots pine forest. However, sampling height (i.e. sun versus shade needles) had a significant effect on the studied parameters, the largest differences being needle stele area, xylem area, phloem area and number of tracheids. Tracheid frequency, leaf-specific hydraulic conductivity and needle density were the only parameters which were not influenced by canopy height. Our measurements revealed that in a given hectare of pine forest stand, water was transported through approximately 40 × 109 tracheids situated in 380 × 106 needles, whose xylem area was 4.34 m2. This type of data could be helpful for modelling and could provide a better understanding of the forest stand environment, of tree hydraulic systems or of eddy covariance flux measurements of this stand, an established ecosystem site within the European ICOS network. RG, JČ and RC conceived, designed and performed research; RG, RP, ZŠ and JU conducted the experiment; DV, RG and RP analysed the data. All authors contributed to the interpretation of results and editing of the manuscript. 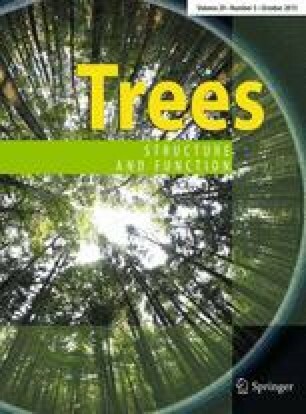 This work was funded by Czech project MSMT COST LD 13017 under the framework of the COST FP1106 network STReESS, Mendel University (Grant IGA 73/2013) and by the project “Indicators of Tree Vitality” (Reg. No. CZ.1.07/2.3.00/20.0265) co-financed by the European Social Fund and the Czech Republic. We would like to acknowledge the contribution of the COST Action FP1106, STReESS. The forest field site has received support from the European Commission’s Fifth and Sixth Framework Programs as the EUROFLUX and Carbo-Euroflux projects.